Perfectly hand-crafted wool sculptures created by a talented mom, hobby sheep farmer, animal lover, experienced dog trainer/competitor and proud 4H Volunteer dog club leader. This page is being constantly updated. DOB 04/08/2016. Bambi is our beautiful Red merle female. DOB 10/16/2015. Babka was one of our first Aussies. DOB 10/1/2015. 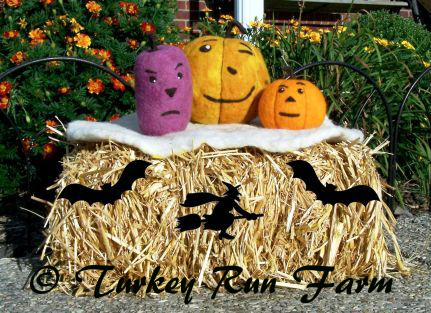 Needle felted Halloween decor. DOB 6/16/2015. Turkey Run Black Bear alias "Rubble" is our new puppy (currently 6 months old) born here @ Turkey Run Farm. Rubble loves to retrieve anything, including a dumbbell. DOB 7/20/2015. This project will be donated to my favorite Henry County Public Library. DOB 4/10/2015. Piece of our nature in fiber Art. DOB 3/30/2015, 10" tall (25.5 cm) and 16" long (41 cm). It took me several weeks to complete this needle felted project. I really enjoyed creating this set of sculptures. DOB: 2/12/2015, 10" tall (25.5 cm) and 9" long (23 cm), glass eyes, Merino wool and Fiber fill. Australian shepherd "Zuzka" is one of our beloved companions here at Turkey Run. DOB: 1/25/2015, 6" tall (15 cm) and 8.5" long (21.5 cm), glass eyes and Merino wool. "Janka" is my workshop project this year. 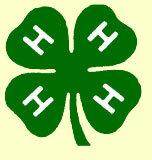 I will be holding workshops in Greencastle, IN (April), Franklin, IN (June) and Lexington, KY (May) Wool festivals. If you would like to learn how to create unique wool sculptures, come to one of these workshops. It will be a lot of fun and you will be able to create your own cute lamb any color you want and cherish it proudly. DOB: 2/17/2014, 4" tall (10 cm) and 8" long (20 cm), glass eyes and Merino wool. "Certik" is my working companion, my right hand on our farm. DOB: 12/23/2014, 2" tall (5 cm) and 5" long (12.5 cm), glass eyes, mostly Merino wool and some Premium Polyester Fiber Fill (inside only), no wire at all. DOB: 12/10/2014, 3" tall (7.5 cm) and 8" long (20 cm), glass eyes, mostly Merino wool and some Premium Polyester Fiber Fill (inside only), no wire at all. "BC" was needle felted for a very good friend of mine for Christmas. DOB: 11/27/2014, 4.5" tall (11 cm) and 5" long (13 cm), glass eyes, mostly Merino wool and some Premium Polyester Fiber Fill (inside only), no wire at all. Angel is a black Shih Tzu owned by son's teacher. It was a Christmas present for Miss Lewis. DOB: 11/7/2014, 5" tall (13 cm) and 6" long (15 cm), glass eyes, mostly Merino wool and some Premium Polyester Fiber Fill (inside only), no wire at all. These needle felted Aussies with "A S C A" tags were donated to ASCA Business Office for Christmas. DOB: 9/10/2014, 15" long (38 cm) and 6" tall (15 cm), glass eyes, mostly Merino wool and some Premium Polyester Fiber Fill (inside only), sculpted and painted clay nose, no wire at all. The mouse toy is needle felted. "Madelyn" is a gracious Siamese cat owned by Jill from Florida. Here is a short, but touching note about her felted Madelyn: "How beautiful! I have a lump in my throat and tears in my eyes!" DOB: 7/25/2014, 10" long (25.5 cm) and 7" tall (18 cm), glass eyes, mostly Merino wool and some Premium Polyester Fiber Fill (inside only), sculpted and painted clay nose, no wire at all. Finley is wearing a real dog collar with a tag that was sculpted and painted from craft clay The tennis ball is needle felted. "Finley" is a 14 year old Aussie who used to serve as a Therapy dog and visited hospitals where he was a big hit with the kids. 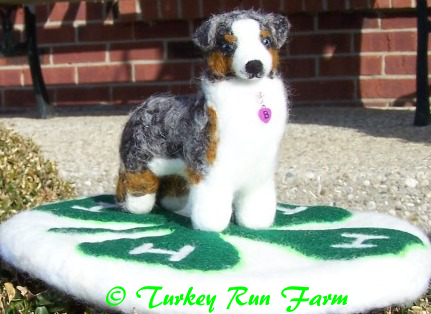 Teresa from Tumwater, WA asked me to needle felt Finley for her friend who owns Finley. Once Teresa received the sculpture she sent me this note: "I am so happy with the way he turned out. She loved it, I thought she was going to cry. Thank you so much for doing such a great job capturing Finley's spirit." DOB: 7/8/2014, 12" long (30.5 cm) and 7" tall (18 cm), glass eyes, mostly Merino wool and some Premium Polyester Fiber Fill (inside only), sculpted and painted clay nose, no wire at all. Misko is wearing a blue bandana and the tennis ball next to him is needle felted. Misko is a 7-year-old Australian shepherd that I am so proud to own. Originally, I planned to have his head down on the ground between his legs. But then I changed my mind as he never lays down in that position. DOB: 5/29/2014, 18" long (46 cm) and 11" tall (28 cm), glass eyes, mostly Merino wool and some Premium Polyester Fiber Fill (inside only), sculpted and painted clay nose. There are many wires in the legs to support the statue that is weighing 1.5 pounds. Max is wearing a real dog collar with a cute flower tag and is "guarding" a needle felted toy. The mat under Max is wet felted by me. Max is the largest sculpture I have made so far. I used my imagination to create a project that would look different. It was quite a challenge to get that pose right. Max was entered in our County Fair in "Miscellaneous class" were he was awarded Blue ribbon. Max was also entered in 2014 KY State Fair in a large "Creative Textile" category where he placed 3rd and received a lot of sweet compliments. DOB: 4/1/2014, 12" long (30.5 cm) and 10" tall (25.5 cm), glass eyes, mostly Merino wool and some Premium Polyester Fiber Fill (inside only), sculpted and painted clay nose. There are some wires in the legs to support the statue. 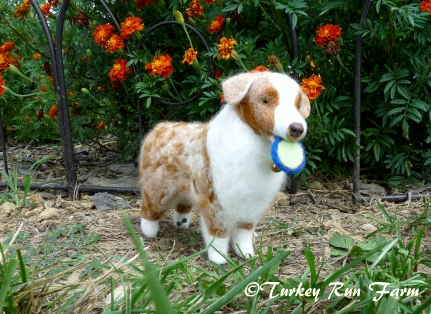 Misty is my friend's Aussie, but I am the breeder of this lovely girl that was felted from digital photos. DOB: 3/3/2014, 11.5" long (29 cm) and 9.5" tall (24 cm), glass eyes, mostly Merino wool and some Premium Polyester Fiber Fill (inside only), sculpted and painted clay nose, no wires at all. Gracie is holding felted Frisbee. Gracie is my 1-year-old Australian shepherd that I am so happy to own. Gracie is that type of a dog that loves everybody and everybody loves her. Felted Gracie was entered in our County Fair in "Miscellaneous class" were she was awarded Red ribbon, right after Max who stole the blue one and the 1st place.